It's my pleasure to be here today, with you, for the 10th annual banking conference of the Hong Kong Institute of Bankers. With 55 years of history, the Institute has definitely lived up to its mission of enhancing and sustaining professionalism in banking. Over the years, the Institute has helped hundreds of thousands of practitioners, as well as graduates eager to join the industry, to acquire essential banking skills and to stay tuned with the latest knowledge of the industry. The theme of this year's conference, "Banking for a Smart Society", couldn't be more timely given that even our very familiar board game, Monopoly, in its latest version, has already done away the brightly coloured banknotes and replaced them with an electronic card. We are certainly in a different era. Our banking sector, I'm pleased to note, is indeed more than ready for the arrival of this new era, a new era marked by the unstoppable wave of innovation and technology. Our banking sector is responding, or to be more precise, evolving smartly. Technology has given rise to a more competitive but yet more vibrant market, boosting product offerings and business performance of banks. If we are to stay ahead of the game, we must fully harness the potential of innovation and technology. To this end, we are undertaking city-wide initiatives to create a smart society. Last December, the Government published the Smart City Blueprint for Hong Kong. Our vision is more than clear: we have to build a smart Hong Kong, and in doing so, we will strengthen our economy and enhance the quality of life in Hong Kong. The Blueprint targets six major areas and more than 70 initiatives. For instance, we will provide an electronic identity for all Hong Kong residents, free of charge. It will allow them to use a single digital identity and authentication to conduct governmental and commercial transactions online. The electronic identity programme will get going in mid-2020. Turning to our banking industry, technology is no doubt a critical game changer. Not long ago, the idea of doing your banking on a computer, or a pocket-sized mobile phone, would have seemed the stuff of science fiction. Today, of course, it's everyday life. Financial technology, or fintech, is reshaping the financial services industry. We are seeing new modes of service delivery, enhanced consumer experience, greater operational efficiency, and improved financial inclusion. Hong Kong is indeed the ideal centre for developing fintech. After all, we are one of the world's leading financial centres. Earlier this month, Hong Kong was ranked third, worldwide, in the Global Financial Centres Index, finishing a scant three points behind London, which just fell short of New York City. The Index rated 110 centres on a wide range of competitive areas. Hong Kong, I'm pleased to report, ranked number one in investment management, as well as infrastructure and human capital. In banking, we finished second, just behind London. All these are contributed by our world-beating financial and banking talents, the free-flow of capital and information, world-class financial infrastructure, a vigorous regulatory framework, our common law legal system and our fine tradition of rule of law. To ensure we progress further, this Government and the Hong Kong Monetary Authority (HKMA) are doing everything we can. The HKMA, for example, launched the Faster Payment System last week, in response to increasing market needs for more efficient and instant electronic payment services. The System supports real-time, round-the-clock fund transfer and payment services in Hong Kong dollars and Renminbi across different banks and stored value facility operators with the use of mobile phone numbers, email addresses or QR (Quick Response) codes. In addition, an industry group led by the HKMA has established a common QR code standard. Using a single QR code will make it a lot easier for merchants, especially small and medium-sized enterprises (SMEs), to accept payment by different schemes. The HKMA also fostered the development of a distributed ledger technology-based trade finance platform which will soon be launched, digitising paper-based documents and automating the trade finance process. This can only help banks and stored value facility operators roll out more innovative payment services; in turn, they will promote their wider adoption by customers and merchants. To encourage the banking sector's adoption of the open application programming interface (API), in July, the HKMA published an Open API Framework following a public consultation. Banks are expected to implement open APIs in four phases starting from next year. I believe the wider adoption of an Open API Framework will promote collaboration between banks and tech firms, stimulating innovation and improving services for customers. Customer confidence is key to the widespread adoption of any new technology. That's particularly true in banking. To that end, the HKMA's Fintech Supervisory Sandbox, launched in 2016, gives the industry a stable testing ground for new products. Last year, the HKMA upgraded the Sandbox, introducing three new features: a Fintech Supervisory Chatroom for supervisory feedback, direct access to the Chatroom by tech firms and a single point of entry linking up the sandboxes of the HKMA, the Securities and Futures Commission (SFC) and the Insurance Authority, thereby facilitating pilot trials of cross-sector fintech products. Sandbox use has steadily expanded since its establishment. I understand the industry appreciates the sandbox's ability to expedite new fintech products, allowing banks and technology companies to obtain user and regulatory feedback at an early stage. We are also promoting virtual banks. In May, the HKMA issued a revised Guideline on the Authorization of Virtual Banks, adapting its existing requirements to better suit the business models of virtual banks. And that is to enable banks, financial institutions and technology companies to promote fintech, and innovation in general in Hong Kong, opening possibilities for them to offer new customer experience. In serving the retail segment, including SMEs, virtual banks can help promote financial inclusion. And I am pleased to note that about 30 applications for virtual bank licenses have been received. The HKMA is now evaluating the applications and hopes to begin granting licences to virtual banks by the end of this year. Fintech, to be sure, does not evolve in isolation. And in this regard, we have been working closely with Shenzhen and other global financial centres. In June, the first Shenzhen-Hong Kong Fintech Award, organised by the HKMA and the Shenzhen Office of Financial Development Service, featured five winners from Hong Kong. The Shenzhen Summer Internship Programme, which began in June, enabled 50 Hong Kong students working there with eight fintech companies for six weeks to allow them to experience Shenzhen's fintech ecosystem. The two cities, I should add, have agreed to provide reciprocal, soft-landing support for fintech. The HKMA has also entered into fintech co-operation agreements with the United Kingdom, Singapore, Switzerland, Poland, Brazil, the Dubai International Financial Centre, and the Abu Dhabi Global Market. The HKMA and the Monetary Authority of Singapore are jointly developing the Global Trade Connectivity Network, a cross-border information highway linking trade and trade finance in the two cities. The HKMA has also made good progress in the Banking Made Easy initiative, which identifies possible regulatory friction in the digital experience of customers. This includes remote onboarding, online finance and online wealth management, while ensuring that the banking sector remains effectively supervised. Anti-money laundering legislation and related guidelines, for example, have been amended to provide greater flexibility for the use of technology in remote customer onboarding. Banks will now be allowed to develop consumer finance portfolios underwritten by such new credit-risk management methods as big data and behavioural analysis. The HKMA has also collaborated with the SFC and the Insurance Authority to streamline requirements for the online distribution of investment and insurance products. A broad and continuing flow of talent is critical to realising our long-term promise, which is why the Government, last month, initiated its first Talent List for Hong Kong. It was designed to support Hong Kong's development as a high value-added and diversified economy. Created, in short, to attract talented individuals from around the world in a more effective and focused manner. To that end, the Talent List features 11 targeted professions with fintech included. Separately, the Technology Talent Admission Scheme also provides fast-track admission for eligible overseas and Mainland research and development talent. Under the first phase of this pilot scheme, tenants and incubatees of the Hong Kong Science Park and Cyberport engaging in fintech, and related areas, are eligible to apply. We're also working to expand local talent through our universities, as well as internships, entrepreneurial training and much more. The Chinese University of Hong Kong, last year, introduced a new, four-year undergraduate programme in fintech. Earlier this year, the University of Hong Kong launched Asia's first fintech open online course, in concert with Australia's University of New South Wales and a number of industry leaders. In January, the HKMA introduced an enhanced version of its Fintech Career Accelerator Scheme, providing full-time banking placements for students looking to take part in fintech projects. And, of course, Fintech Week opening in just over a month, will attract about 8 000 participants from some 50 countries and regions. This year, for the first time, Fintech Week will travel to Shenzhen on the event's final day, definitely drawing participants' attention to the opportunities in the Guangdong-Hong Kong-Macao Greater Bay Area. 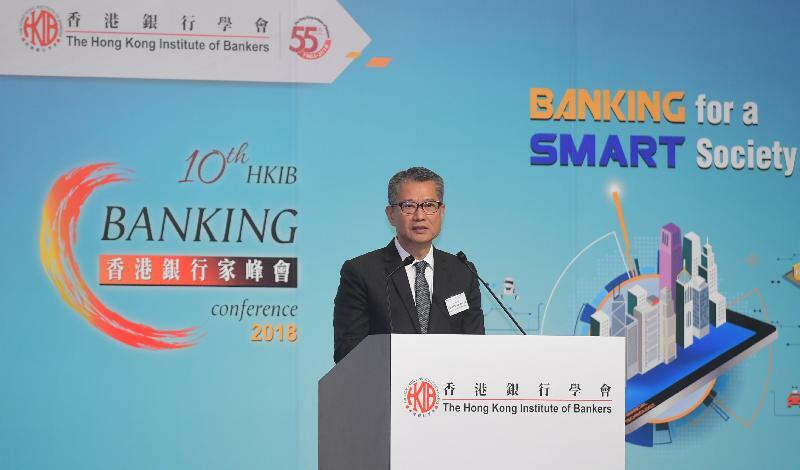 I am very pleased to note that the Hong Kong Institute of Bankers is playing a proactive role in helping the industry to capitalise on the opportunities ahead. On this, may I congratulate the Institute again on its 55th anniversary. And I wish you all a fruitful conference and continuing prosperity in the years ahead.